The object of the Association is to foster, promote and encourage the enjoyment, traditions, and preservation of schooners by supporting individuals and organizations that are in sympathy with our object, by maintaining a record of these vessels past and present, and by coordinating a program of racing and cruising. The American Schooner Association, founded in 1972, is a national organization whose members are owners of schooners, sailors and other individuals and organizations interested in preserving and promoting the virtues of the schooner rig. Membership is granted to all applicants in sympathy with the purposes of the Association. The Association produces a Newsletter titled Wing & Wing for all members and holds its annual meeting at Mystic Seaport, in Mystic, Connecticut, usually around the first week in February. 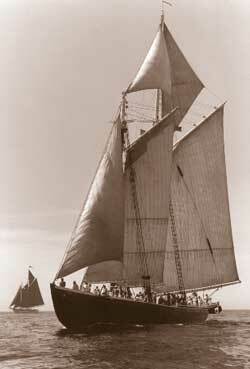 Our membership is actively engaged in building, restoring and sailing these wonderful vessels. We encourage all individuals with similar interests to join us and help us grow (click here to join by mail or use our secure online payment system). Happy April First!!! I hope any April Fool’s Day activities do NOT involve members’ vessels! TGIF! With about a week to go, we are counting down to our Chapter Meeting (10 to 12, 3/16) at the Md Yacht Club. The Agenda is going to be packed, not only are there elections and reports as well as new developments and insights to busy Chapter projects but we will have new info from the Great Chesapeake Bay Schooner Race as well as our speaker Rick Truett from the Gibson Island Boat Works. Hello everyone, Back from a great National Meet up in Mystic! A super time with outstanding friends, lots of sharing and plans for this next year! For OUR meeting, this week we were fortunate to lock in as our speaker, Rick Truett, General Manager from the Gibson Island Boatworks. Hello Everyone, Just a post nationally to let everyone know we have moved our meeting back into March to allow for folks and their vessel commissioning work in April. This Year, it will be held at the Maryland Yacht Club at 1500 Fairview Beach Road Pasadena, MD 21122.